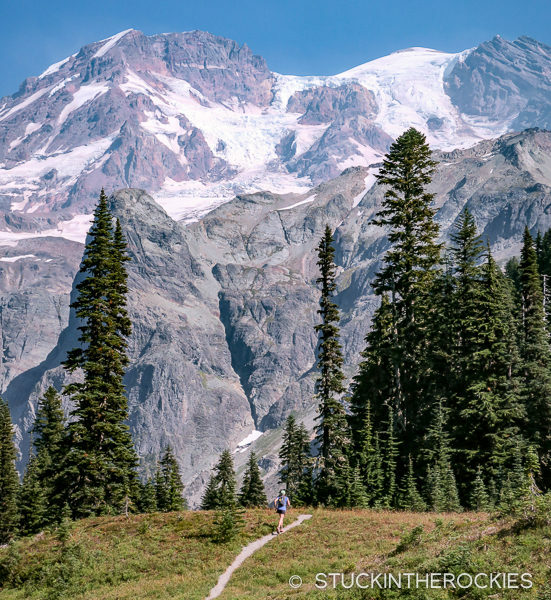 Mount Rainier and the 93 mile Wonderland Trail. 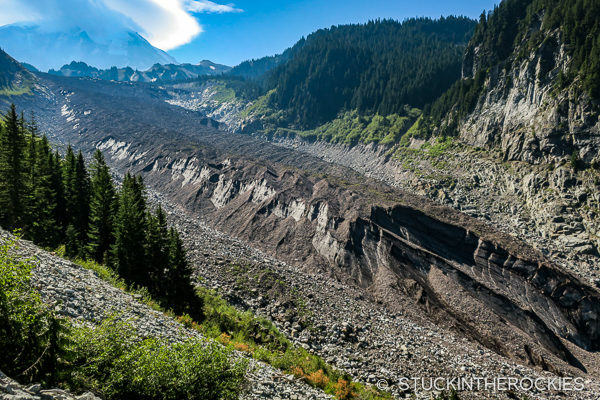 In 1899 Mount Rainier became the nation’s 5th National Park, a well deserved designation for one of the most iconic mountains of North America. Soon afterwards, work began on a project to construct a trail that circumnavigated the spectacular 14,440 foot summit. 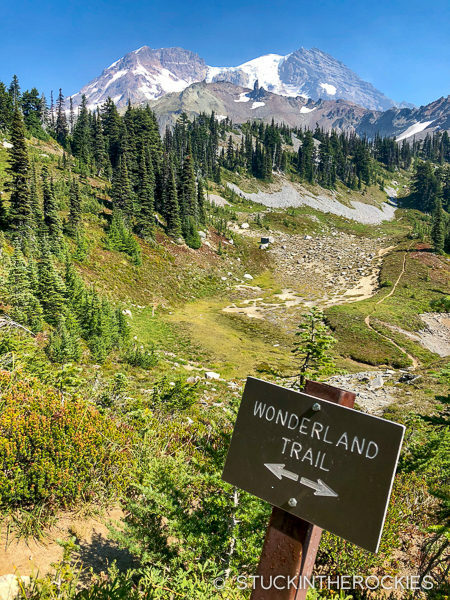 Years later, after subsequent refinements and re-routes, the 93 mile Wonderland Trail was created. 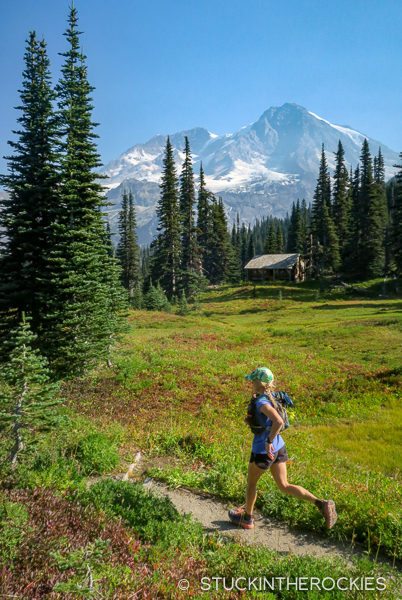 Now over 100 years old, the historic trail courses through high alpine meadows and old-growth forests, across glacial moraines and fields of wildflowers, climbing 22,000 feet along the way and always with the stunning backdrop of Mount Rainier. 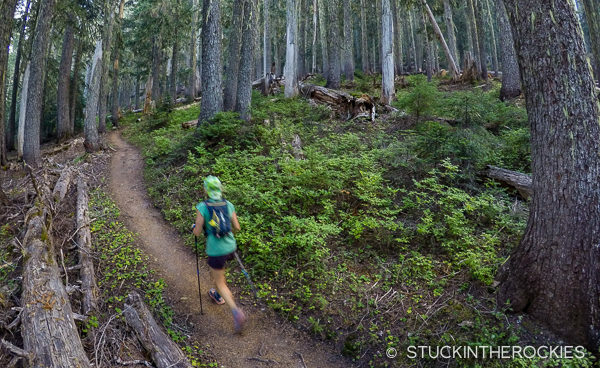 Considered to be one of the great trails of the National Parks, it’s no wonder it has become a bucket-list adventure for thru-hikers, backpackers, and trail runners alike. As a backpacker you can spread out the experience over 7-12 days, making use of 20 different permitted, wilderness campsites. 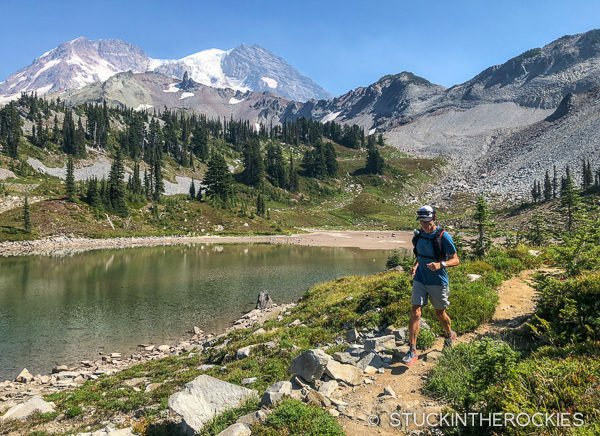 Trail runners like to move faster, and if you fall into that group as we do, it’s possible to complete the loop over three long days, spending nights at a few popular Mount Rainier front-country campgrounds. 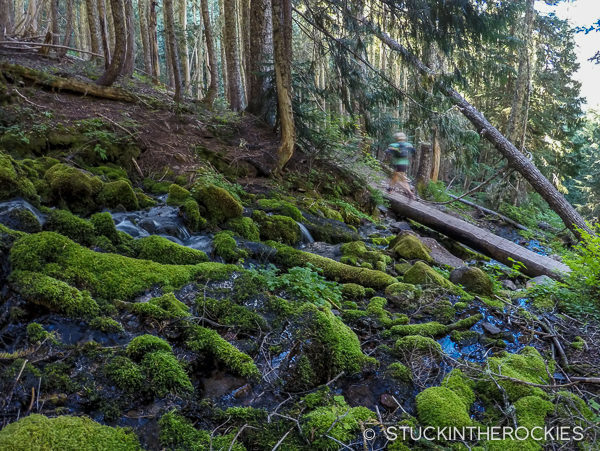 But tackling the Wonderland Trail in this style brings with it a couple of challenges. 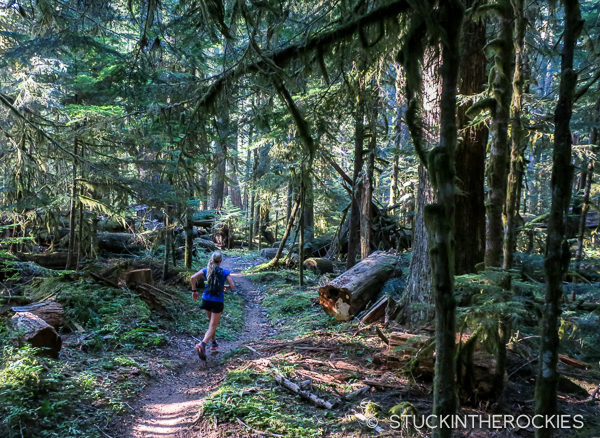 First, you need to have the fitness to cover some 30 miles of trail in a day with considerable elevation gain. And you have to be able to do that for three days in a row. 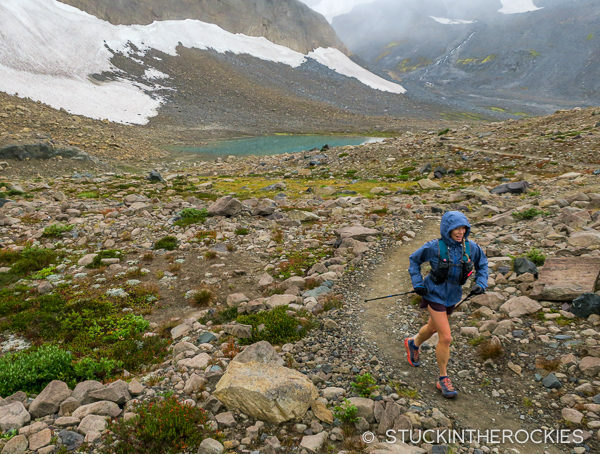 It’s not exactly an “off the couch” effort and it might warrant some specific training. The elevation chart of the Wonderland Trail, we moved from left to right, starting at Longmire. Click to enlarge. 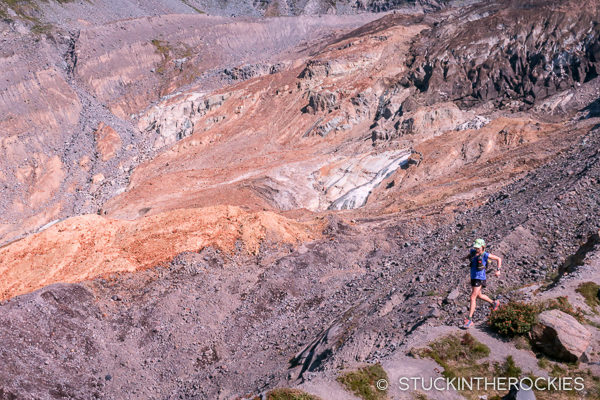 As tough as that may sound, some find the bigger challenge for the trail running option to be logistical. Repeated long days on the trail require you eat well and sleep comfortably. 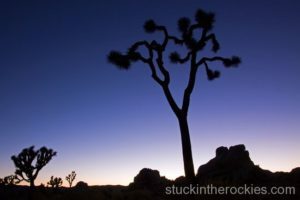 Since you’re continually moving around the mountain, staying somewhere different each night, you’ll need to arrange to have food, clothing, and camping gear in those different locations as well. A graphic of the route. We started at the lower left at Longmire and followed it clockwise. Click to enlarge. 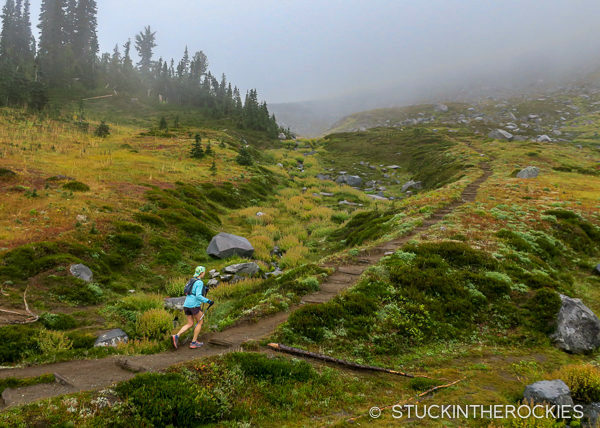 It’s too much to carry on the trail and still cover the miles. You could setup caches at each campsite in advance and collect everything after you complete the route, but that adds days to your trip. 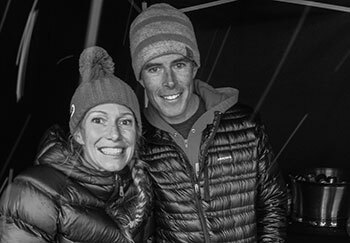 If you’re lucky and you have loving friends and family who enjoy supporting your efforts, you might be able to recruit a few of them to help with meals and gear shuttling. That can be a tough sell too, especially if you live far away. If caches take too much time and crew support isn’t an option, consider using our friends at Aspire Adventure Running. 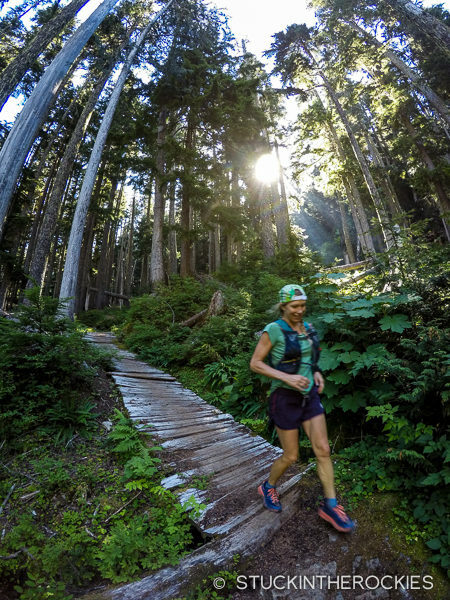 Aspire Adventure Running organizes trail running adventures through the Northwest, from the Cascades of Washington State to Northern California. 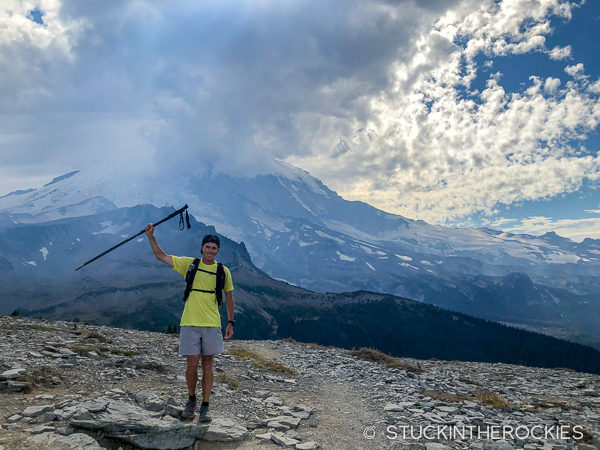 From single day adventures to multi-day efforts such as the Wonderland and Lost Coast trails, they will help with meals, camping, transportation and any other logistical details that are needed. They’ll pick you up at the airport, guide you on the trail, and help with everything in between. 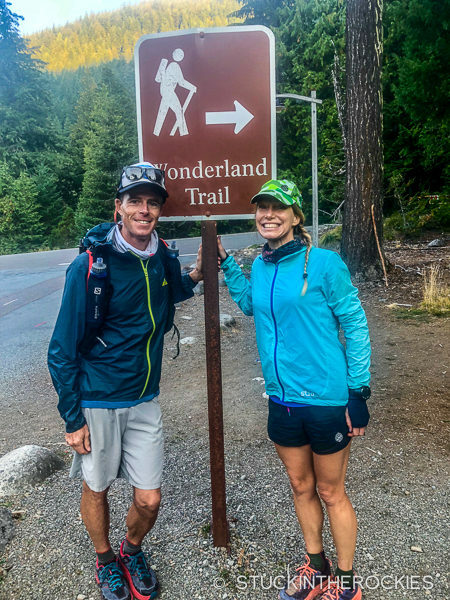 Coming from Colorado with a limited amount of time, local info, or contacts in the area, Aspire really made our Wonderland Trail adventure possible. 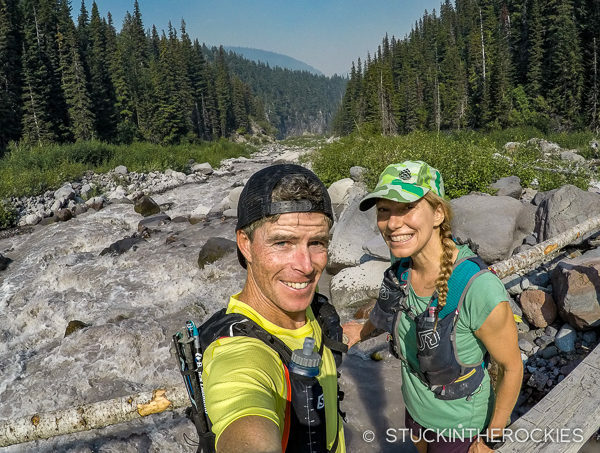 They put together awesome meals in the morning and the evening and send us out with everything we needed for the day— trail and weather info, clothing and gear recommendations for the conditions, and of course lunch and snacks— all we had to do was show up ready. At camp the night before embarking on the Wonderland Trail. We spent the first night camping just outside the park entrance near Ashford, WA and after breakfast we made our way to our starting point at Longmire. If you begin the loop at Longmire and go in a clockwise direction, you’ll get the longest leg done on the first day. You’ll pass through popular areas like Indian Henry’s Hunting Ground, Emerald Ridge, St. Andrew’s Lake, and Golden Lakes. 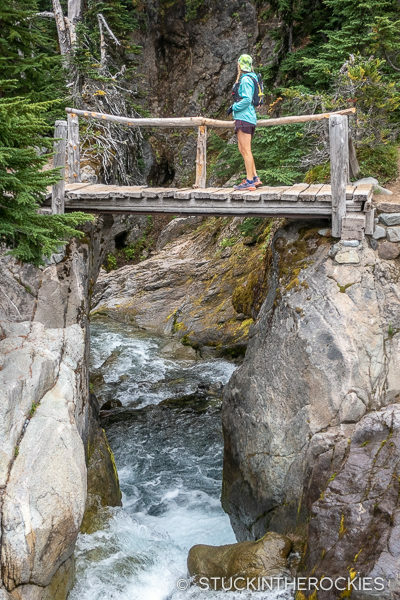 You’ll cross several creeks and rivers including North and South Puyallup rivers, the South Mowich River, and Tahoma Creek which has a giant suspension bridge across it. 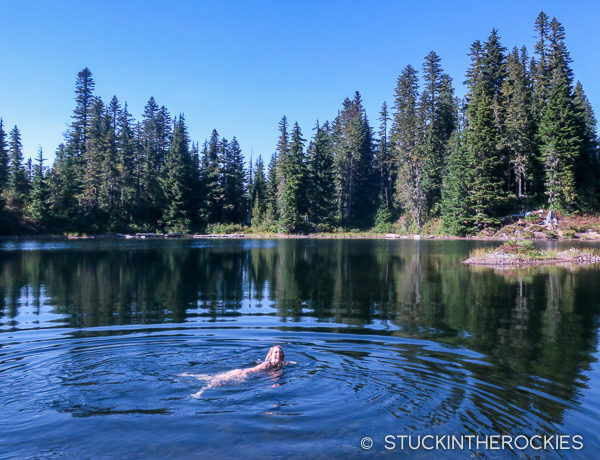 After a long and tiring effort (take a chance to swim in Golden Lakes if you have time) you’ll reach the Mowich Lake Campground where you’ll spend the night. Getting sorted and having breakfast at camp before starting on the first day. Ready to get started, at the Longmire trailhead. 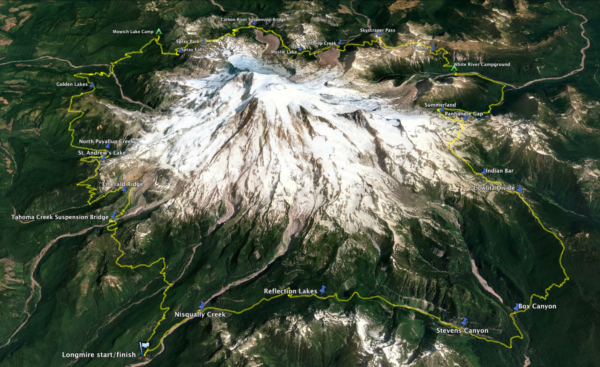 One of the early views we caught of Mount Rainier was in the area known as Indian Henry’s Hunting Grounds. The old patrol cabin can be seen in the trees. 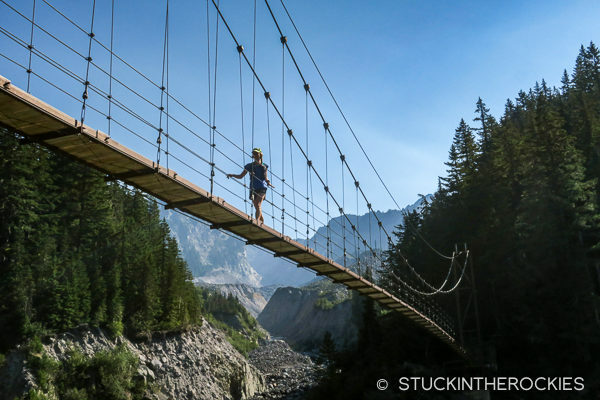 Crossing the Tahoma Creek Suspension Bridge. The sign recommends only one person at a time crossing it, which seemed like good advice. Up on Emerald Ridge there was some wildly colored geology all around. After climbing up from Tahoma Creek, we passed St. Andrews Lake on the way to Klaptche Park and the North Puyallup River. Klaptche Park and some big views. 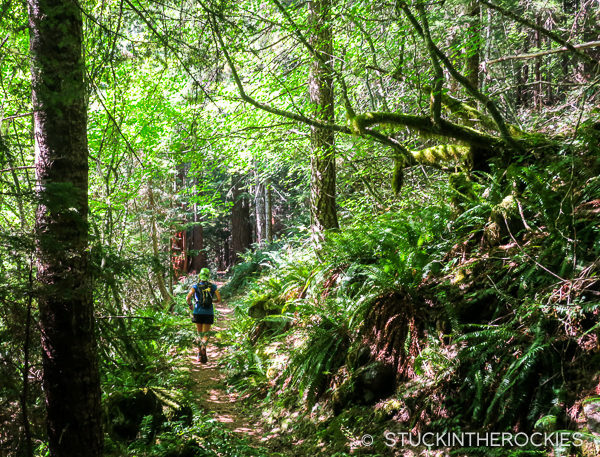 At lower elevations there were incredible green zones with massive vegetation and/or old growth forests. We took a moment to take a dip in one of the Golden Lakes, a welcome break during the long first day. 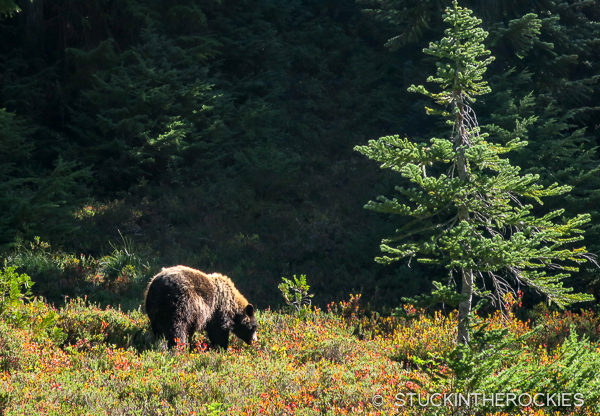 There are a lot of sights and potential distractions along the Wonderland Trail. 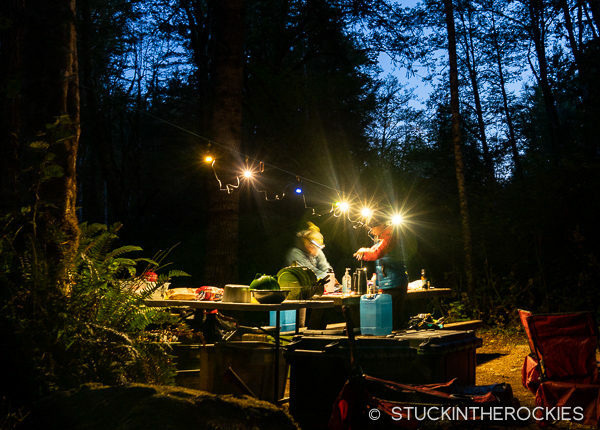 Try to do and see as much as you can, but not so much that you end up arriving to camp in the dark. Descending from Golden Lakes to the South Mowich River. Crossing the South Mowich River on a more typical bridge. From here it was one more stout climb up to camp to wrap up our first day. 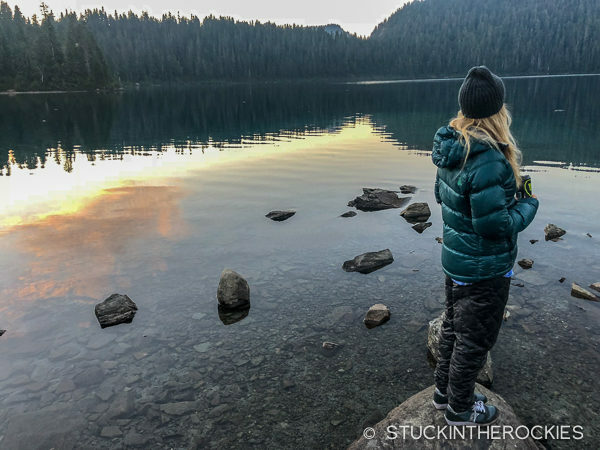 After the long day we cleaned up and changed and headed over to Mowich Lake for sunset. Once the sun went down things felt really chilly and we were really glad to have all our extra layers. Aspire setup a great post-run spread followed by dinner and we were in the tent early and asleep before we knew it. From Mowich Lake Campground you actually have two options to start the second day. 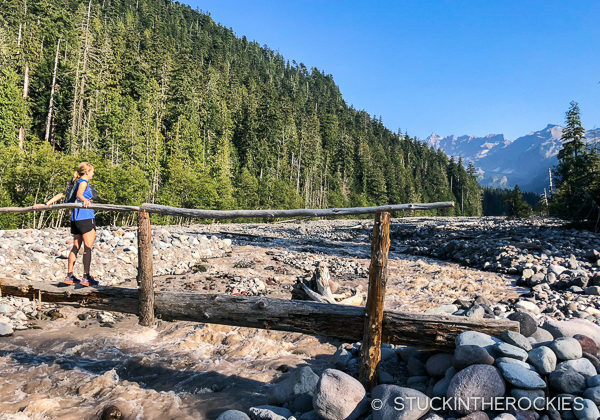 The normal Wonderland Trail will take you to Ipsut Creek and the Carbon River, or you can follow an alternate route through Spray Park. We chose the latter after learning it could offer better views of Rainier (though it comes with added vertical). 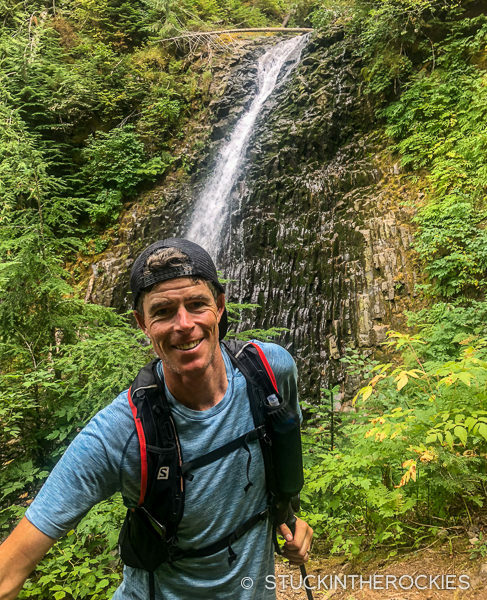 Along the way we stopped at Eagle Cliff, checked out Spray Falls and Spray Park and eventually rejoined the Wonderland Trail at the Carbon River Suspension Bridge, the second one of the route. After crossing the Carbon River we climbed up to Mystic Lake. From there the trail heads up to Skyscraper Pass, through the popular Sunrise area. A long descent led to the White River Campground, where we spent the night. The first stop on day two (through Spray Park) was an overlook called Eagle Cliff. 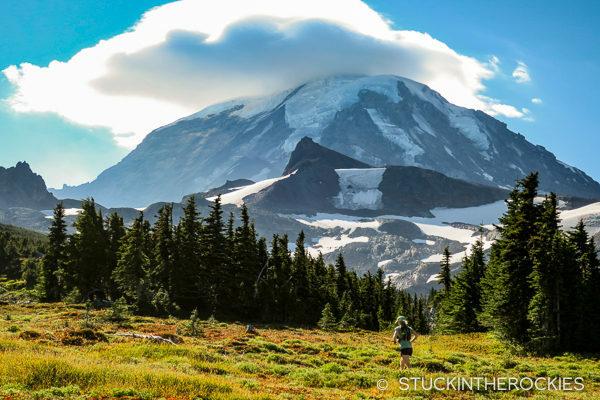 Mount Rainier was in view with an impressive lenticular cloud hovering over its summit. 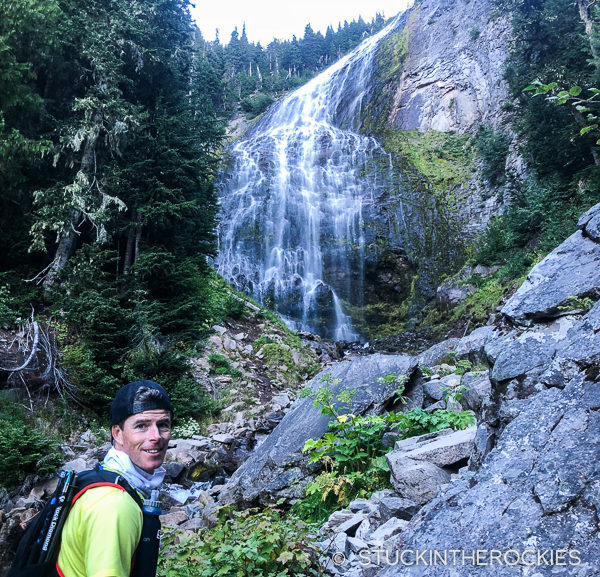 We made a short side trip to the impressive cascade called Spray Falls. It was an ideal day to check out this alternate section of the course, the views were really good. The high parts of Spray Park had less vegetation and were more lunar-like than the terrain the day before. We saw a few locals along that section of trail as well. 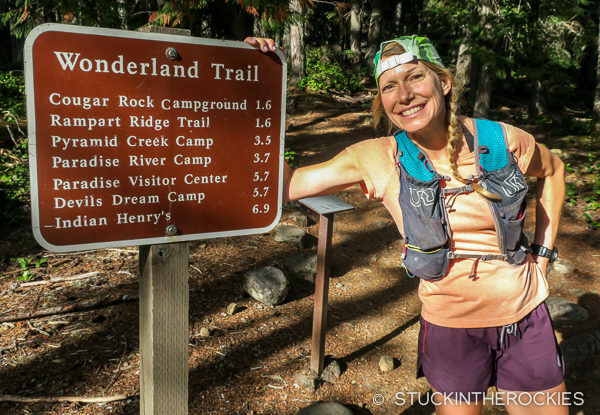 Among the many things we loved about the Wonderland Trail was that the signage at all intersections was really good. The second suspension bridge on the route was over the Carbon Glacier. Faking a cough at Mystic Lake. Partway through the day a lot of wildfire smoke moved in from some burn zones to the north of the mountain. Back in a green zone. Crossing the bridge over Winthrop Creek. Heading up to Granite Creek Campground and Skyscraper Pass. Cresting Skyscraper Pass in the afternoon. Descending to White River where we spent the night. After finishing our second day, we cleaned up, ate and relaxed at the camp Aspire had setup at White River. 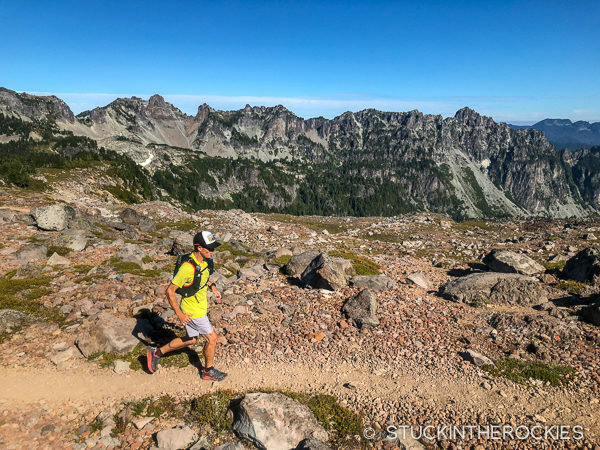 The third and final day started gradually and climbed up to an area called Summerland and then Panhandle Gap, which at 6,800 feet was the the high point of the loop. Despite the mountain being obscured by clouds all day, we found the terrain through this section to be pretty incredible. 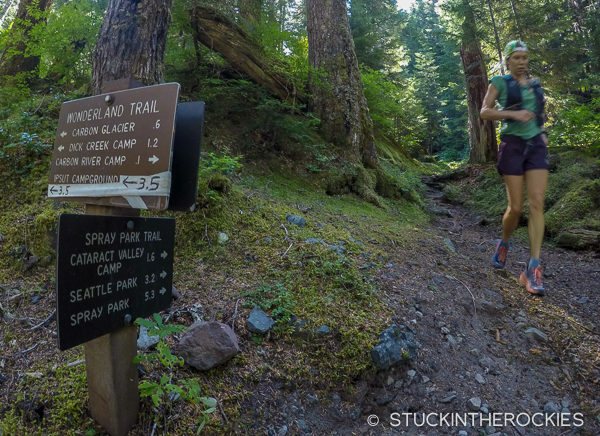 The section from Ohanapecosh Park to Indian Bar and up to the Cowlitz Divide was really cool. 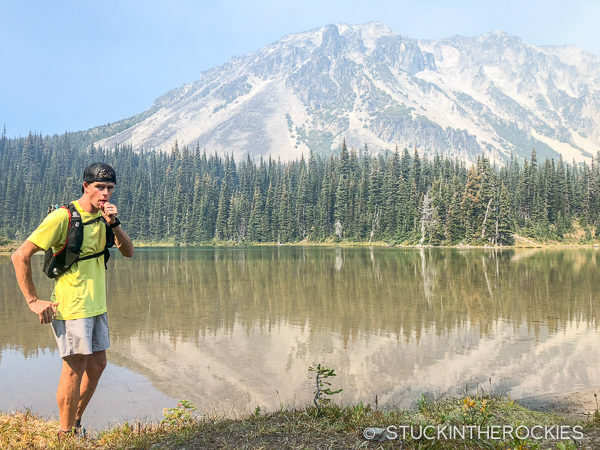 After descending from the Cowlitz Divide we arrived at the Box Canyon trailhead and began our return to Longmire through Stevens Canyon and past Reflection Lakes. From the lakes it’s a long steady descent to Longmire where we closed the loop and celebrated being able to finally get out on this trail. 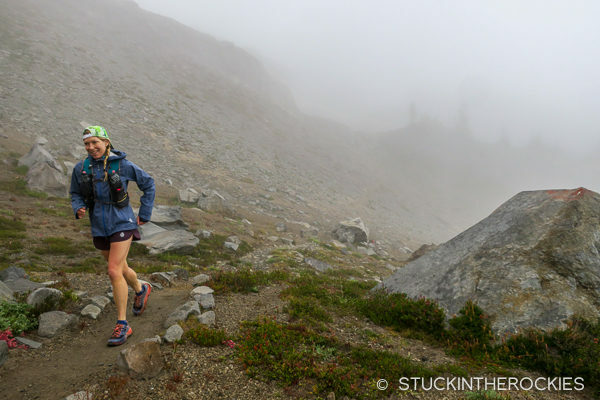 The third day brought some clouds, fog, and cooler temps. The first part of this leg brought us up through a zone called Summerland, seen here, not looking too summery. Above Summerland we made our way to Panhandle Gap. 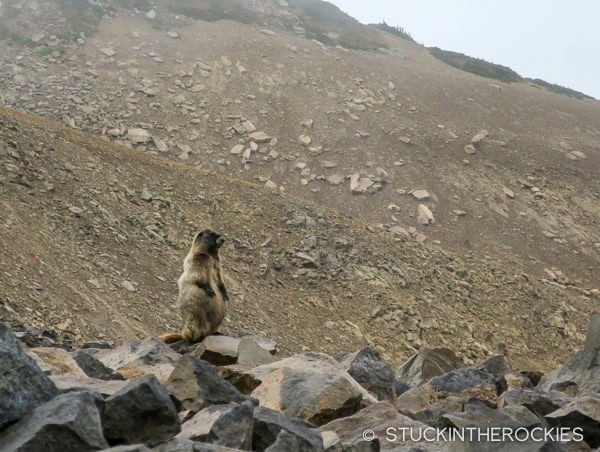 Another local, a Hoary Marmot, different from the Yellow-bellied Marmots that we have in Colorado. It was pretty foggy through the section of trail in Ohanapecosh Park. Crossing a gorge and the creek at Indian Bar. 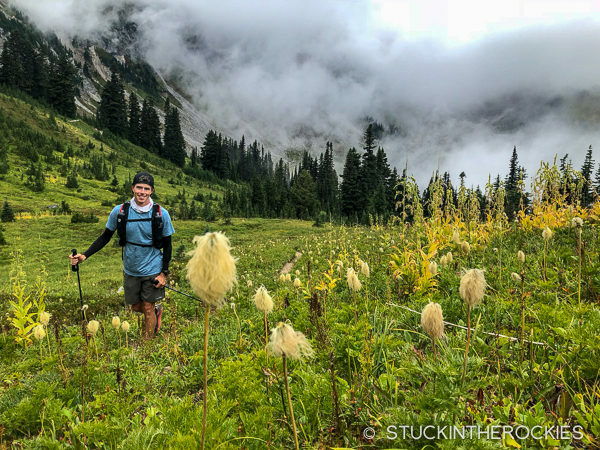 After Indian Bar we climbed up to Cowlitz Divide, through a field of Dr. Seuss-like wildflowers called Western Anenome’s. 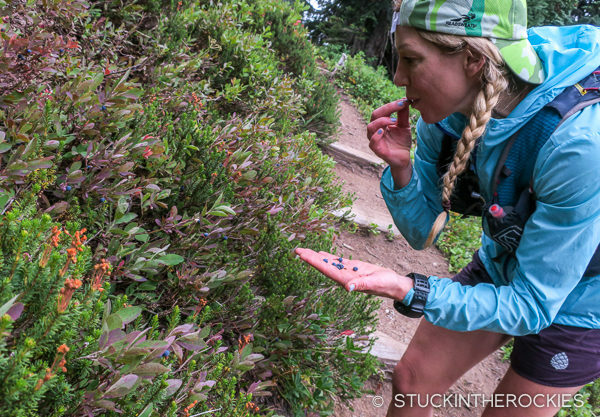 Christy loved to stop and pick wild blueberries along the trail. They were really good. Tired and nearing the homestretch, somewhere in Stevens Canyon. Back at the Longmire Trailhead, 3 days and 90+ miles behind in, all smiles. 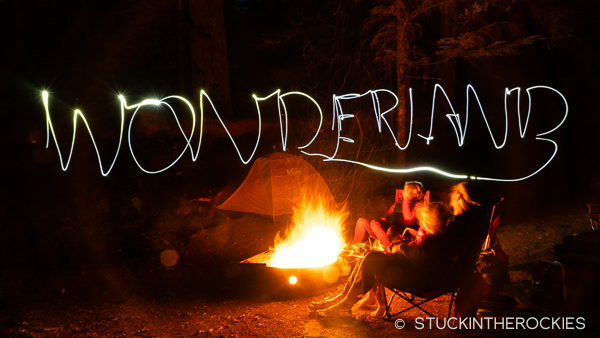 Put the Wonderland Trail on your list. The route is as beautiful as it is challenging and we couldn’t be happier to have finally had a chance to see it. 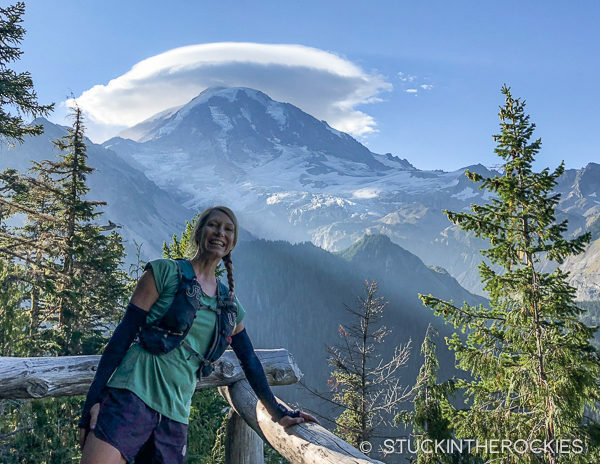 Each day and each climb is rewarded with a continually changing view of the mountain and landscape, something that all trail runners can appreciate. If you’re having a hard time with getting it all organized, definitely considering having Aspire Adventure Running help with the details. Jake, you two would love it. It was awesome, but for years we put if off because it seemed too hard to organize. Amazing! Great pics and so fun to follow along, virtually. Thank you for sharing an amazing adventure. 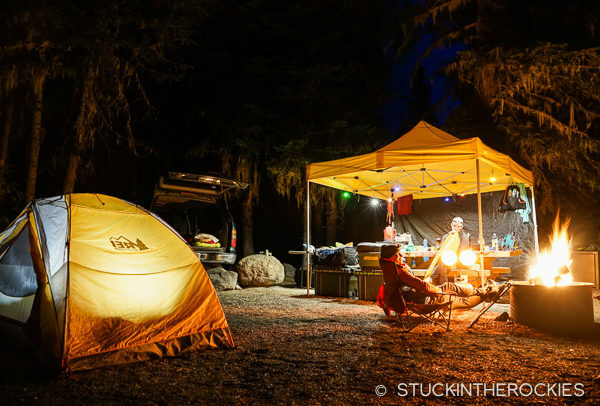 Question … were there any cougars at Cougar Lake Campground? Thanks, it was great to finally see up close. Scott, I don’t recall seeing Cougar Lake Campground, but we did see a group of three hauling skis up the trail for some September turns above Spray Park. Apologies. It was ‘Cougar Rock’ in the photo of the sign, not Cougar Lake. No cougars, of any kind. really fun reading this and fantastic pictures. You’d love it up there. Check it out if you can. 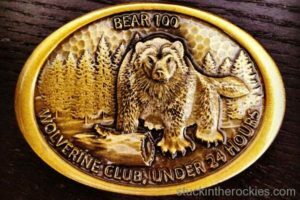 Hi – can you clarify the time frame of the run/hike? 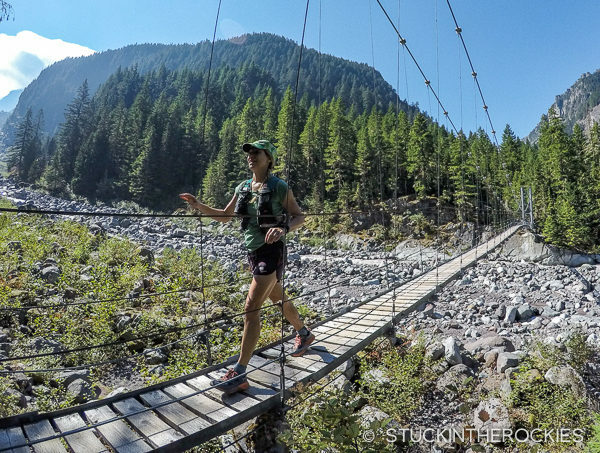 We did the same trail in late July / August and the bridge over Winthrop creek was treacherous ! No railing, and water splashing over the log. Unfortunately someone slipped and fell on this like 2 days after us and didn’t make it. But in your photo the river looks a bit more tame and bridge has railing. Hi Peter. We ran the loop during the week after Labor Day, early September. Even then some of the bridges seemed to be just a big rainstorm away from being overtaken by the creeks, but in the end they were all good for us. I bet that was a little concerning for you.